SMS is getting a facelift at Mobile World Congress. IP services developer Mavenir Systems (see disclosure) is launching a new cloud messaging platform next week that could turn carriers’ staid old text messaging into a much more vibrant communications platform on par with services like Apple’s iMessage(s aapl). But most importantly the technology preserves SMS’s most valuable asset: its ubiquity. Let’s face it: SMS is a dinosaur. Except for the addition of basic multimedia through MMS, it’s hardly evolved in a decade. A rash of new mobile IP services have emerged to profit from SMS’s shortcomings: iMessage, BlackBerry(s rimm) Messenger, Google Chat(s goog) and countless other IM and social networking apps. Not only do they offer more features and functions than SMS, they have the ultimate benefit of being free. Ovum estimated that, globally, operators missed out on $22.6 billion in SMS revenues in 2010 and 2011 as IP social messaging apps took over their traditional texting traffic. The ironic thing is that operators could have lost much, much more. SMS traffic is still increasing despite the move to smartphones, and the reason is SMS has one ace in the hole: it works. I can send a text message to almost any mobile phone number in the world, and I’m virtually assured my intended recipient will receive it. Platforms like iMessage and Messenger require you to have an iOS or BlackBerry device. IM and social messaging services require you and your friends to have an account and their apps installed on your phones. SMS has the added benefit of using the signaling channel of an operator’s network to transmit its payload, ensuring the message will go through no matter what network and what network conditions it traverses. IP services depend on having a decent data connection, which is hardly a given, no matter how far we’ve come with 3G and 4G. What Mavenir proposes is to combine the universality of SMS with the IP messaging features that SMS technology can’t support: live chat, group messaging, multimedia sharing, and network storage for shared files. But rather than tie the service to a particular device ecosystem like Apple or a particular account like Google, Mavenir’s Mobile Cloud Messenging (MCM) is tied to a phone number, just like SMS. Mavenir’s platform isn’t standards based, which would normally be a big problem. It depends on operators running Mavenir’s network equipment and pre-installing Mavenir’s client on all devices. If your operator isn’t a Mavenir customer, then those richer features won’t work for you. At first glance, it seems Mavenir is asking us to substitute Apple’s proprietary solution for its own. But the beauty of Mavenir’s implementation is that it simply defaults to SMS and MMS if it doesn’t find its client or server at the other end of the message. Of course, all of those extra features go away if the message is forced onto the SMS channel, but the point is that MCM acts as a bridge between today’s new richer IP services and old reliable text messaging. Except for SMS forwarding and other gimmicky approaches to the technology, the two camps have always been isolated. MCM probably won’t stop the flood of users to free IM platforms, but by offering more features, operators could at least try to justify the SMS rates they’re charging. Ideally, a platform like MCM becomes part of a standard, not a proprietary and closed system, and Shubh claimed that Mavenir has the exact same aim. The problem is the standards process is slow and unwieldy. The GSMA and many of the operators have backed a technology called Rich Communications Suite, which promises all of the features of MCM plus video chat and instant file sharing. RCS, however, requires a lot of network ingredients that will take operators years to find: LTE, moving voice and SMS over to LTE (or VoLTE), an overhaul of their core service delivery architectures (know as IMS), and the replacement of billions of phones’ SMS clients with RCS clients. Shubh said Mavenir plans to integrate MCM with RCS standards as they emerge, and is already working heavily within the VoLTE standards space. But operators need to start moving SMS forward while waiting for those standard to become commercially viable, Shubh said. Otherwise, they’ll watch all of their SMS traffic disappear into the IP ether. Hm, except that Apple’s proprietary solution (iMessage) does exactly the same fallback to SMS and MMS. Glad you recognize Apple is a proprietary solution full of holes, painted over with Green and Blue to hide the gaps. This will be proprietary to the operator, to attack BBM and iMessage, but provide default global inter-working via SMS and MMS via the network, instead of the client. Same number, multi-device, irrespective of the type of OS on your smart phone. 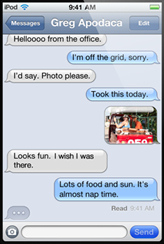 The iMessage client displays SMS conversations, but apart from appearing on the same screen, they’re hardly integrated. Like some before me, I don’t see why SMS needs ‘updating’. Why would SMS need an update though? I don’t see why things should be changed the way they are at the moment. Maybe I’m just not getting what SMS 2.0 is all about then..
For customers, it’d be nice to see that number doubled. I’m sorry, is the point of this article to make carriers MORE money? If so, it’d serve best to convert this to a white paper and submit it to TechRepublic for mobile executives who care. I’m not hurt at all that carriers “missed out” on making an explosive profit on every text message. The high competition will surely benefit the consumer. This service is more about operators innovating and responding to the demand, and maybe preserving some value. Today, I have 6 messaging clients on my Android (SMS, Skype, Whatsapp, Facebook, Google Voice, Yahoo), each for a different set of buddies. It would be nice to have one app to reach all on my phone book and then just maybe Facebook for the social postings..
I’m not sure what you mean. Should I just not write about operators and only cover over the top services? The point is that operators might be able to offer a truly ubiquitous IP chat service that can work between any mobile phone, which isn’t available in the market today. Whether you or other consumers are willing to pay for it is another question. I agree pricing SMS pricing is too high, but SMS alternatives simply don’t cut it. If Apple and Google figure out a way to cut across fragmentation, I’m all for it, but I simply don’t see them doing it. You take an ubiquitous service, convert it to run over IP, add the features that IP provides, and then connect it back to the ubiquitous service. I think this is the future of the telcos. Very good point. Rogers has an advantage most operators don’t though, an IMS core. We’re going to see a lot more of though as LTE and VoLTE comes into its own. This is kind of confusing. I’m not really getting a sense of how this technology is going to/is work(ing). I agree with Lindsworth. SMS is such a simple service…Ideally our cell bills should consist of one price – data. Voice, SMS, Web, Video – they are all just data. I wish it was that simple.. Even on the web, I pay for data PLUS Amazon Prime PLUS Skype credits PLUS iTunes subscription. Oh and do not forget the Facebook credits.. Nothing is really free is it? I agree though that voice, messaging (SMS and more), video should collapse into a single, simple charge.